Many books have been written about Second World War special forces operations in Europe and the Middle East. Much less has been said about such operations in South-East Asia – those launched against the Japanese in Sumatra and the Andaman Islands, and the Germans in Goa. These operations, and the exceptional men who took part in them, have been almost forgotten. David Miller, in this gripping account, sets the record straight. 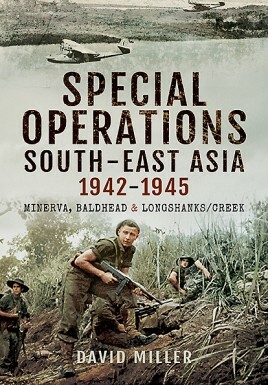 His book is based on extensive original research, including long-hidden family documents, revealing much information for the first time and his narrative is fascinating reading for anyone who is interested in special operations and the war against the Axis powers in South-East Asia. His history is the first general account of these operations - it is a landmark in the field. David Miller has had seventy books published on subjects ranging from Richard the Lionheart, through the samurai, to U-boats and the Battle of Waterloo. His great love is the sea – his father was a naval officer – and this book is the outcome of many years’ study of Captain Langsdorff, one of the most admired officers of the German Second World War Kriegsmarine.